To view our current inventory of vintage and antique binnacles, click here! Presented is a large size skylight binnacle that follows a 100 year old design. It was made by the famous John E. Hand & Sons Company of Philadelphia. This one likely dates from the 1950's. It has six glass panels, with a Hand 6 inch gimbaled compass stamped on the compass bezel with Serial Number 6209. Because of their high cost of manufacture, binnacles like this were only found on the most expensive yachts and therefore, only infrequently come on the market. This one is is about 3 inches taller than the one PERKO used to make and is the same height, but 1/2 inches wider than today's E.S. Ritchie recreations that may be purchased new. BOGART' S SANTANA : Binnacles such as these became very popular starting in the 1920's. 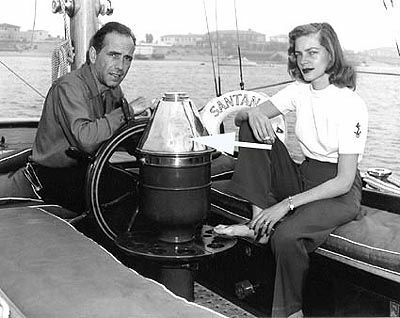 Their popularity may have increased after one was seen aboard the motor vessel "Santana" in the movie "Key Largo" (1948) staring Humphrey Bogart and Lauren Bacall. Bogie also had one in the cockpit of his famous yawl Santana. Here it is shown covered with a chrome hood. Our ketch Bagheera was fitted with one and served us well during seven years of ocean cruising. PERKO discontinued making them about 1954, and Danforth in 2010. Today, the only source of skylight binnacles is from E.S. Ritchie. Their's are priced on the street at $2195.00, but arguably use thinner metal stampings, but have the advantage of a more advanced compass. CONDITION: All the metal work has been re-plated and may be considered new. The over plating makes the maker's name tag unreadable. All the glass was replaced. The compass is original and the fluid has been drained for shipping. The compass card is not properly balanced and at times hangs up. Unless it is going back to sea that is a good way to leave it. .
DIMENSIONS: Overall 13 1/2"H x 10 1/4"W D WEIGHT 11 pounds Diameter of compass card 4 3/4" Diameter of compass 6"
The Hand Company built navigational equipment for all varieties of ships, and operated a chain of retail outlets with service facilities in key ports, including Baltimore and New Orleans. Until 1956, these outlets sold Hand instruments as well as other nautical accoutrement's and provided compass adjusting services. Additionally, John E. and his two sons, John L. and Bartram, were inventors, who patented design improvements for numerous instruments that were employed in the company’s work. The company was primarily involved in commercial shipping until the late 1930s when the United States military began preparations for World War II. Though the Hand Company never completely abandoned its involvement with private industry, after World War II, military contracts continued to be their major business. Of note are the wrist compass, they developed for the Navy beginning in the 1950's, and the Mark VII Model 5 Navy Standard Binnacle. Though it moved numerous times, the Hand Company headquarters and factory remained in the Delaware Valley, occupying several buildings in Philadelphia and southern New Jersey. Maintaining its central office in Philadelphia well into the 1900's, the factory was moved to Atco, New Jersey around the turn of the twentieth century and subsequently to Haddonfield, New Jersey. It moved one last time in the 1960's to Cherry Hill, New Jersey. In 1997, California-based Sunset Cliffs Merchandising Corporation purchased the Hand Company and all its assets for a small amount, but did not make use of its brand name. This rare Skylight or Cathedral binnacle is almost ready to go to sea or it is suitable as a gift or as an addition to any collection of fine marine artifacts. Copyright 2015 by Land And Sea Collection™ All Rights Reserved!